A great New Year's tradition in our family is Chinese food. In keeping with the "skillet" theme this week, here is our fast and easy Chinese New Year Dinner. Typically, I'll use pork tenderloin when I make this instead of the roast. 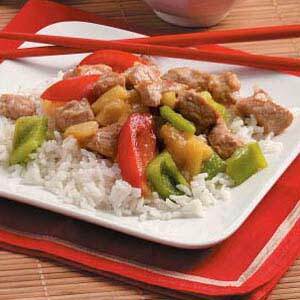 In a large skillet, cook pork in oil over medium heat on all sides until pork is lightly browned; drain.Drain pineapple, reserving juice in a 2-cup measuring cup; set pineapple aside. Add enough water to the juice to measure 1-1/4 cups; stir into pork. Add the vinegar, sugar, salt and garlic. Bring to a boil, stirring constantly. Reduce heat; cover and simmer for 20 minutes or until meat is tender. Meanwhile, cook rice according to package directions. In a small bowl, combine cornstarch and water until smooth; stir into pork mixture. Bring to a boil; cook and stir for 2 minutes or until thickened. Stir in the green pepper, tomato, soy sauce, sesame oil and reserved pineapple; heat through. Serve with rice. Yield: 4 servings.